Bebe also produced one of the best classroom instruments covers we've EVER had. 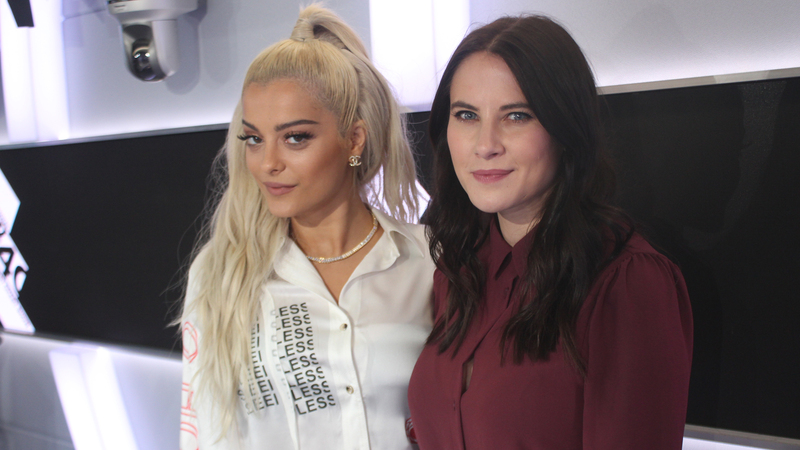 Bebe Rexha popped in for a catch-up with Kat Shoob on The Official Vodafone Big Top 40 about her hit 'Meant to Be'. In a huge exclusive, Bebe confirmed rumours that she features on Rita Ora's new single 'Girls' and revealed that Charli XCX and Cardi B are also on this massive, all-female collaboration! The music video for 'Girls' is done, with Bebe and Rita filming their scenes in London and Charli and Cardi doing theirs in LA. Bebe joked that it'd have been a tad mean to have put Cardi on a plane for the London shoot when she's very, very pregnant! Bebe said that the video is not just about wanting to kiss girls but about self-love too. Bebe chatted about how tight she is with Rita and how genuine she is compared to some girls in the industry. We also learnt about a rather wild night out that Bebe and Rita had together - along with Bebe's mum! Bebe's debut album Expectations is out June 22nd 2018 and there's definitely going to be a couple of exciting collabs on it. The problem is - Bebe wouldn't give any more information away! When asked by Kat about a possible track with Taylor Swift, Bebe was pretty coy... but didn't confirm nor deny it exists. Like all our guests, Bebe took on our infamous 'classroom instruments cover challenge' (we're still working on the name) and absolutely smashed it! Bebe played the keyboard and belted out an incredible version of Whitney Houston's 'I Wanna Dance With Somebody', which ranks as one of the best we've ever had on the show! We also heard how Bebe didn't know who Florida Georgia Line were until she met them in the studio, the funny encounter Bebe had with Simon Cowell years after she auditioned for American Idol (and didn't get through) and how she'd love to work with Gwen Stefani. We'll try our best to make it happen! > Where did 'Meant To Be' get to on this week's chart? See the full Top 40!